Indaba is one of the top three travel trade shows in the world and is a showcase for Southern African tourism products and services for the international travel trade. It draws travel agents from far and wide, conference organisers, tour operators, advertisers and the media. More than 12 000 people participated in Indaba this year despite the global economic crisis. Prince Albert with Beaufort West, Laingsburg, Murraysburg and Matjiesfontein represented Cape Karoo Tourism at Indaba 2009. 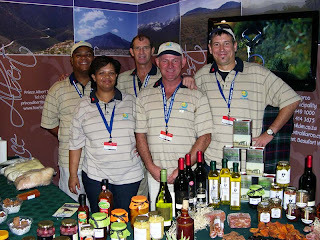 The region’s stall, sponsored by the Central Karoo Regional Tourism Office, was part of the huge Western Cape tourism exhibition. According to Michael, the Cape Karoo Tourism stand was very much a joint effort, with each town contributing decorative elements, local products and information against a backdrop of eye-catching, life-size posters depicting the different areas of the Central Karoo. A journalist with British Airways’ in-flight magazine, Horizon, was instructed by her editor to visit the Cape Karoo Tourism stall as preparation for an article on Prince Albert, while West Coast travel agents want the stand – as it was set up at Indaba - to tour the main towns along the coast. Many tour operators were particularly keen to discover that the Central Karoo is an ideal destination during South Africa’s winter months, when it is drizzling and grey on the Cape coastal areas. Prince Albert’s reputation as an out of the ordinary tourism destination was also strengthened by the participation of the town’s new recreational cooking school, African Relish, at Indaba 2009. Jeremy Freemantle, CEO and executive chef, Vanie Padayachee, worked long hours promoting their new culinary tourism experience to international tour operators. Both were very encouraged at the huge interest in South African tourism products. “We’re excited about drawing tourists to Prince Albert throughout the year and that will undoubtedly contribute to the people and the economy of our town,” Jeremy told the Friend.